When Houdini made his movies in Hollywood, there were no gala movie premieres, no Hollywood sign, and no Academy Awards. But that hasn't stopped him from being named Best Actor of 1919! 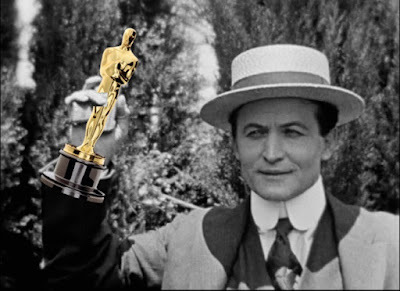 Yes, Houdini has now picked up an Oscar via the blog Through the Shattered Lens Presents The Oscars, which re-imagines Oscar history even in the years prior to the official start of the Academy Awards in 1928. The site has named Houdini Best Actor of 1919 for "playing himself" in The Grim Game. The award was presented by his friend Roscoe "Fatty" Arbuckle at The Sixth Annual Academy Awards held on February 20, 1920 at the Hollywood Hotel. Other winners included James Cruze as Best Director for The Roaring Road. Cruze also directed Houdini in Terror Island in 1920 (so let's not forget him next year). Mary Miles Minter took home the Best Actress Oscar for Anne of Green Gables. Bolshevism on Trial was named Best Picture of 1919. While The Grim Game was also nominated for Best Engineering Effects, it lost out to Burton King's The Lost Battalion. King would later direct Houdini in The Man From Beyond and Haldane of the Secret Service. Congratulations to Houdini for not only conquering Hollywood this year with the triumphant return of The Grim Game, but now conquering The Motion Picture Academy. He's King of the World! Thanks to Dorothy Dietrich and Dicks Brookz at the Houdini Museum in Scranton for discovering this one. Here's remembering our own magical night in Hollywood at the premiere of the now Oscar winning The Grim Game. I wish the oscars would create a new special category to award posthumous films and talent that have stood the test of time but didn't get a citation during their time. Any word if The Grim Game will be making its way to DVD or Blu-ray sometime soon? No word yet. But at least it hits TCM on Oct 18. Would HH have gone back to the movies? An Oscar would have looked sweet next to that silver punchbowl and Mirror Cuffs. I think the coming of sound would have tempted Houdini back into film work in some way. Maybe not producing his own movies again, but he would appear back in movies in some form. Absolutely, sound would have tempted HH to return to film work, at least for brief appearances. The Great Depression hammered magicians and Thurston had to work shows during the breaks in film presentations in movie theaters. He complained that the schedule was punishing. I don't think HH would have gone for that. Houdini would have had not problem performing in movie theaters had the money been right. His background was circus, dime museums, medicine shows and vaudeville. Many of these were what was known as "in one" presentations. He was not reliant on the full evening show, with big props, production numbers and big box tricks like Thurston and others. In vaudeville his competition for headlining the show, where personality was key, was the likes of Eddie Cantor, Al Jolson, W. C. Fields, Sophie Tucker, etc., who could all do a show stopping turn in only 18 minutes. The restored Houdini Grim Game to be on TCM Oct 18. It certainly would have been a step down for him, being an opening act for a movie (that wasn't his own). But a lot of vaudevillians and magicians had to do this as most vaudeville theaters became movies houses. But I think Houdini had already moved on from vaudeville and would have continued with his full evening show as Thurston and others did. And I suspect he would have gotten involved in radio in some way. I wrote a speculative blog on what Houdini might have done had he lived HERE. Please note in our post we said, "had the money been right." What we were referring to was that vaude houses that showed movies were not all the same. Some would occasionally bring in special headliners, where admission prices might even be raised because of who the headliner was. Some, as I recall, possibly the Palace in NYC, at times, would even bring in special shows where they would not even have a movie as part of the deal for those special showings. Houses that showed only movies, but were also old vaude houses, would also at times bring in a single feature performer, not an entire 8 act show, as an added attraction to draw in extra people for the week or even just the weekend. Not so sure Houdini, had he gone to the Orient post 1926, would have wanted to travel with a full evening show which is a lot more work than he would have been used to, given the many years, as a star, he worked essentially as a single. Given his background, and what he was used to, and where he had his most success as a dynamic, essentially single performer, who knew how to "work the boards," I think he would have tired of the hard work and expense of running and performing in a full evening show, much as it stoked his ego. The full evening show is partly what killed him. Also, owning the rights to his later films, he could have traveled with one of the films, or excerpts of "the best of the films" along with his updated stage act, what ever that might be as time rolled on. Broadway revues like the Follies ran till 1936 or later, and Houdini might have figured some stunts he could present for those type shows as he had done earlier. He could have also continued on the lecture circuit, but I do not think those would have brought in as much money. Hellzapoppin opened on Broadway at the original 46th Street Theatre on September 22, 1938, transferred to the Winter Garden Theatre on November 26, 1938, and finally moved to the Majestic Theatre on November 25, 1941, closing on December 17, 1941. Houdini could have been featured in it instead of Hardeen. Indeed. You're right. With the right amount of money and proper setting, Houdini might have very well done a single act before a movie. True, he might have seen this as much easier work than his full evening show and it would have allowed him more time to write books, etc, With the right pay and promotion, I think Houdini was open to a lot of new and emerging entrainment channels. Had he been in the Broadway version of Hellzapoppin I do not believe they would have dropped Houdini from the film version as the did Hardeen. Imagine we could have seen Houdini in this fun movie with sound. Hard to imagine Harry in Hellzapoppin because he would not have been the star. But who knows. One thinks of Karloff in Arsenic and Old Lace. The idea of a superstar playing in a supporting role that pokes fun at his superstar image...could have worked.